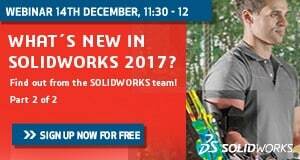 What’s New in SOLIDWORKS 2017? Find out from the SOLIDWORKS team! In just 30 minutes, Mattias, a SOLIDWORKS Technical Manager will lead you through some of our favourite key features and will be happy to answer any of your questions at the end of the presentation.